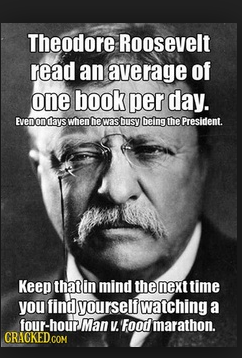 Scrolling through Facebook I see my Mom has posted something about Teddy Roosevelt reading a book a day while he was president. I doubled tapped the screen, then I realized I was speaking Instagram and translated my gesture to more appropriate thumbs up. America wanted to love Teddy, and still does. You'll find a ton of sites going all fanboy over how he habitually read a book before breakfast (and up to three books a day), he exercised for three hours a day (with his kids, repelling out of the highest windows of the White House using knotted sheets, if he could; if not, boxing with ill-fortuned member of some diplomat corp). After such a hearty day he would have a big dinner and then give some thought to what was going on in Congress before falling happily asleep. Wait. What? Who cooked him dinner? How did all his clothes get clean and pressed and bought and tailored? How many kids did he take to one school then the other school then their friend's house then Target then somewhere else and then finally cook dinner? Teddy R. had people to do that FOR him, giving him license to guilt-free binge read books when not talking about his Big Stick, shooting things and having Great Ideas. Such a life of leisure. After that digression I put my phone down and pick up Book #13. When a student handed this to me I hugged it and said "oooh!. The cover was haunting, intriguing. The title elegant and mellifluous. Ten pages into the book and I want to send out a tweet shouting my outrage at EVERY PERSON who has ever read this book and not passed it on to me! This book is about orphans, horror and WW2 in Europe. Triple delicious. No wonder it was a best seller. This author has a gift for crafting a sky castle book world as different-and-the-same-but-more-magical as JK Rowling's Hogwarts. I have no trouble tuning out the world and staying put in this history-love-horror-magic story, and finish the book by dusk. I'll read this book again, and until then I'm googling this author to find his other books and also half-hoping there might be a sequel. If this were a self-directed adventure I would have read at least one more book by this author (if possible) before moving into a less magical sky castle book story. Ex-students, former teachers, friends show up with books, adding firewood to my bonfire. Even though I'm not even halfway through this reading adventure I'm a little sad at not doing this again, not walking into class everyday with a new book, a new quote, a new piece of the universe to share. Maybe I'll open this to 50 books? Here's a Title -- "100 Books My College Students Assigned Me (and I actually read)"
Maybe not. Maybe 32 is enough. What would Teddy Roosevelt do?